These delicate little birds are intelligent, inquisitive, friendly, hardy, active, non-destructive, and easy to maintain. 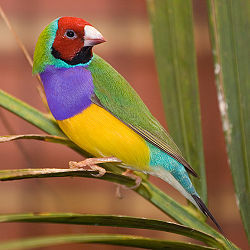 Lady Gouldian Finch are, in general, quiet although males do have a pleasant melodious song. They are appreciated for their beautiful colors, erect posture, graceful shape and peaceful temperament. It is imperative to know from the start that these little jewels of nature do not like to live alone. They prefer the company of other finches. Breeding Lady Gouldians takes planning and preparation. If breeding them is not your intention, I would strongly suggest getting two or more males. Finches in general prefer the company of other finches to that of humans. They tend to be skittish and rarely bond with their owners. Don’t let that disappoint you. Believe me they are watching everything you do for them. They will tolerate a 30 degree temperature variation in a 24 hour period. Protect them from temperatures below 6 degrees C, 45 degrees F.
Breast and chest colors are more intense. They are vibrant purples, reds, blacks, yellows and oranges. Breast and head colors are muted. During the Gouldian finch breeding period, the females’ beaks will darken, almost to black. There is no visual difference at this stage of development. Routinely they appear in varying shades of olives, tans and grays. 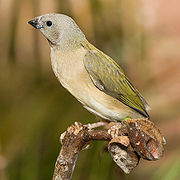 Lady Gouldian Finches are native only to northern Australia. They are members of the weaver family, ESTRILDIDAE and are commonly referred to as Australian Grassfinches because in the wild they choose to inhabit open savannah regions that are sparsely wooded, subtropical grasslands. Gouldians are not fond of rain forests as they are often damp and cold. Gouldians feed mostly on ripe and half-ripe grass seeds of Sorghum spc. During the dry season, they forage on the ground for fallen seed. During the wet season, Spinifex grass seed, Triodia Spc., is an important component of their diet. Many other finch species are known to also eat insects and in the wild in Australia so do Lady Gouldians. In the United States, it is rare that a Gouldian will even try eating insects provided for food. 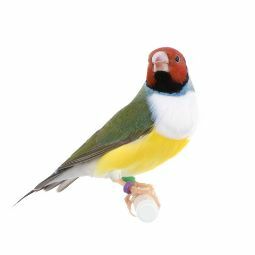 Prior to the Australian government ban on the export of Australia fauna in 1959, Gouldian Finches were exported primarily to Japan, England and America. These captive birds have resulted in viable breeding colonies in many different countries. Captive breeding has lead to a number of genetic mutations that affect the color of Gouldians’ feathers. The most commonly available mutation is the white-breasted. Another mutation, the blue-breasted is quite rare. The normally purple-breast feathers of these birds have been replaced by a brilliant shade of cobalt blue feathers. On the blue or blue-backed Lady Gouldians the usual green feathers on the wings and back have been replaced by various shades of blue feathers and the yellow-body or yellow-backed Gouldians have yellow feathers on their back and wings. More information about Lady Gouldian mutations will be covered in depth as I build this site. Three basic head and body colors appear in nature. The black-headed, purple-breasted Lady Gouldian Finch are the most common found in Australia in spite of the fact that the red-headed, purple-breasted birds are genetically dominant to the yellow and black-headed mutations.